Property 22: Charming Village house 25 min from TLV! Property 30: Supreme 2Bdrm & 2Bath - 2 min walk to the beach! Property 42: Amazing Beach-Port Duplex+Parking! Property 43: Stunning villa for family vacation. Private pool. Pet friendly. Property 47: 4 bedroom duplex house in a lovely quiet neighborhood. This was a truly special house. Very spacious for our family of five (including three teenagers) with every amenity, including air conditioner, washer/ dryer, WiFi and a modern, well stocked kitchen. While the house was amazing, the best part was the location. We were in a wonderful, quaint neighborhood that was walking distance from shops, restaurants and probably one of the best beaches in the world. The beach was a very short drive but also a short walk (which we did). We had a quiet, beautiful, soft sandy beach and the water was warm and the waves were perfect for body surfing and boogie boarding. My kids even took surfing lessons from the local lifeguards. Also,the sunsets were spectacular. The location was also perfect for day trips to explore the Tel Aviv/ Jaffa area and other parts of Israel. The host&rsquo;s sister was very helpful including meeting us very late for check in and check out and was available to answer questions and provide any help we needed. If we can come back, this would be our first choice of where we would want to stay. Comfortable quiet home with wonderful indoor/outdoor spaces, and it&rsquo;s walking distance to the beach! My family of 6 (four adults and two young children) stayed for a week in this lovely Caesarea home. The home is newly remodeled with terrific indoor/outdoor spaces,a lovely private garden on the bottom floor and two additional decks with comfortable seating. With so many options, everyone had a private space to relax. The interior is also quite comfortable and bright with individual air conditioning units in each room. There are two small kitchens, but interior counter space is limited for cooking large meals indoors. I have stayed in many VRBO/Homeaway properties and this home is one of my favorites. Perhaps the most special element is the owner Liat, who is genuinely engaged and interested in making sure her guests are well cared for. She met us at the home when we arrived, offered helpful suggestions to enhance our stay, and was available and responsive throughout. We really appreciated this personal attention and really made the trip extra-special. 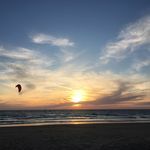 The home is also in a fantastic location, just a short walk to a fabulous beach, the best one I&rsquo;ve been to in Israel&mdash;excellent for walking, swimming, and playing in the sand. During our summer stay, we found the beach rarely crowded on weekday mornings and afternoons. The home is also close to a kibbutz that has several opportunities for fun, including a small animal petting zoo which our 3- year olds enjoyed. Overall, we loved our stay and would recommend this home to anyone looking to stay in Caesarea.